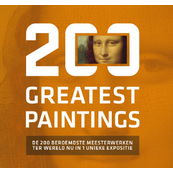 The Exhibition 200 Greatest Paintings consists of a canon of Western art that everyone knows. Masterpieces such as the Mona Lisa, The Night Watch and American Gothic are coming to Rotterdam! Art connoisseurs and laymen have compiled a list of the two hundred most coveted, valuable and famous artworks in the world. This list includes works from eighty different museums, made by more than hundred artists. These two hundred works are reproduced full-size and chronologically exhibited. Go on a journey through the history of art, without having to fly around the globe! Besides a lot to see there is much to do in the exhibition. There are twenty specials of the ' most' iconic artworks of the exhibition . By these specials the exhibition comes to life. An example of a special is the darkroom of Vermeer. Vermeer made his work with a camera obscura . The same darkroom is recreated where you can make a work with the techniques of Vemeer! There is also a children's route which has more emphasis on "doing" things and is slightly shorter . We won’t tell you anymore, just come and see for your self! Buy your tickets online! It’s cheaper than getting your tickets at the door and you don’t have to wait in line! Ticket prices range from 4 to 12 euros. Children under 4 years go for free. Leonardo Da Vinci, The Last Supper, 1498. Pieter Bruegel the Elder, Tower of Babel (small), 1563. Hieronymus Bosch, The Garden of Earthly Delights, 1490. Jean-Louis Theodore Géricault, Medusa’s Raft, 1819. Rembrandt van Rijn, Night Watch, 1642. Johannes Vermeer, Girl with the Pearl, 1665. Johannes Vermeer, The Milkmaid, 1658. Édouard Manet, Lunch on the Grass, 1862. Frida Kahlo, The Two Fridas, 1939. Piet Mondrian, Victory Boogie-Woogie, 1944. Andy Warhol, Marilyn Monroe, 1967. Maurits Cornelis Escher, Relativity, 1953. Keith Haring, no title, 1985. Heel erg leerzaam en leuk! !